Tuesday morning, I scanned twitter and discovered a post from Coach John Ford near the top of my feed. As is the fashion when you have more to say than 280 characters will allow, Coach Ford had screenshotted an image of a note saying farewell to his Buford athletes. some require 280 characters. I require a blog. It took me a minute to understand the post. Perhaps, I needed some coffee. The post seemed to indicate that Coach Ford would no longer be the head coach for Buford High School. My first assumption was not that he had been released, but rather that he was perhaps pursuing a college coaching position. *In an official press release, Athletic Director Tom Wolfe frames Ford’s release as a resignation. Similarly, Jeff Sessions recently resigned as Attorney General. Coach Fiord speaking for the RYFCA “One Roswell” Clinic. I first got to know Coach Ford when he took over the helm at Roswell High School. I had a combination of middle school and elementary school football players in my home at the time, and had taken a position on the Roswell Youth Football & Cheer Association board to help support the youth programs. We decided to put together a youth football clinic for our prospective athletes, both football players and cheerleaders, and solicited Coach Ford’s involvement with the program. Coach Ford didn’t hesitate. He immediately promised that he and his staff would run the program and would bring a busload of Varsity athletes to help facilitate the drills. My job would be to make sure they all got first dibs at the Varsity food truck I secured to cater the event. I got to know Coach Ford a little better through the years as he would often attend the Jr. Hornet football games. That’s right, Coach Ford would frequently spend his entire Saturday cheering on the future Hornets as they developed as young athletes. This was after a Friday night game and Saturday morning film session. I remember asking him at the time why he bothered to show up. His response was impressive. By the time the middle schoolers became high school players, Coach Ford already knew them all by name as well as their strengths and weaknesses. Cole with Clemson’s Tre Lamar. I’ll never forget when my son was called up to the Varsity squad following the completion of his Freshman football season. Essentially, the Freshman players become fresh bodies and tackling dummies for the older athletes. There is zero expectation that the athletes would actually see playing time, but it is a good chance for the Freshman to show their hustle and frankly their courage. My son jumped right in. I’ll never forget watching from the stands as Cole ran about 40 drills in a row. First, he was the middle linebacker trying to tackle running back Sheldon Evans, now playing for Marshall. #WellMadeThen, Cole became the running back, carrying the rock up the middle to the outstretched arms of Tre Lamar, a finalist for the Butkus Award from Clemson. #WellMade Cole took quite the punishment, but earned the respect of his future teammates and coaches. I remember talking to Coach Ford later that week about Cole’s future with the team. Coach Ford simply said, “Cole is like a bowling ball covered in Ginsu knives.” That’s Coachspeak for a tough athlete. Coach Ford delivering a speech about playing for love for one another rather than hatred for your opponent prior to a 47-0 victory over Archer high school. Coach Ford coaching up Malik Willis #WellMade before the 2016-17 State Championship Game. Malik now plays for Auburn University. Over the next two seasons, things got really fun. Roswell put together 2 Championship seasons that both ended in trips to the Georgia Dome for the State Championship game. I volunteered as a chaplain for the team with the North Fulton Fellowship of Christian Athletes. We’d provide pizza for the players on Mondays after practice with a short devotional, pray with the athletes in the fieldhouse before the game, and earned spots on the sideline for the Friday Night action. I got to share in something incredibly special with my son that will provide a treasure chest of memories for the rest of our lives. During these years, I received a frontrow seat to Coach Ford’s leadership. I witnessed countless speeches that had all the players (and me) ready to run through a brick wall. I heard fiery rebukes of poor performance, glowing praise for exemplary effort, and calm resolve in the face of adversity. I’ll never forget the comeback at Grayson to earn Roswell a spot in the State Championship for 2016. Coach Ford and Marcelino Ball, now playing for Indiana, #WellMade seemed to be the only 2 people in the stadium that believed it could be done. Roswell vs. Grayson in the 2015-16 Semi-Finals. The most incredible comeback I’ve ever witnessed. I grew to tremendously admire the man who was helping to shape my son’s character just as much as much as I could ever hope to as his father. Don’t get me wrong. Coach Ford isn’t a saint. He’s a football coach. Occasionally, his speeches would contain a well-place expletive. Profanity is a bit of the vernacular of football. Sometimes, clipboards would hit the turf in frustration on a failed execution. However, what I always saw was that Coach Ford loved the athletes like his own flesh and blood. He never tried to take away their spotlight, but rather took responsibility for their shortcomings. From my estimation, he embodies everything you could ever hope for in a leader.. In fact, I remember the two of us having a conversation about the book “Season of Life.” In it, the author puts forward a thesis that primary job of a football team is to learn to love one another. When I told Coach Ford about the book, he let me know that he had read the book years before, and it was the foundation of his personal mission as a coach. Two and a half years ago, Coach Ford accepted the Buford Head Coach position. I’ll be honest, I felt extremely conflicted. It felt like my son and his classmates were being abandoned. My son’s Senior class was light on numbers, and, frankly, quite a bit short of talent compared to the 2 previous classes absolutely stacked with collegiate-level athletes. Adversity lay ahead including the toughest schedule in the state. I knew that much of the adversity would be unavoidable. When Coach Ford left, it felt like they were going to have to face it alone. Roswell struggled last year in a season of transition. As a captain, my son took every loss personally. He had played for too long under Ford’s coaching to willingly accept defeat. Though he’s no longer playing football, he too is #WellMade. On the other hand, I was incredibly happy for Coach Ford. His stock was deservedly high after two incredible seasons. He was getting an incredible opportunity in perhaps the most prestigious and best paying coaching opportunity in the state. I couldn’t fault him for seizing the opportunity. He had a young family and a chance to receive the compensation his talent merited. 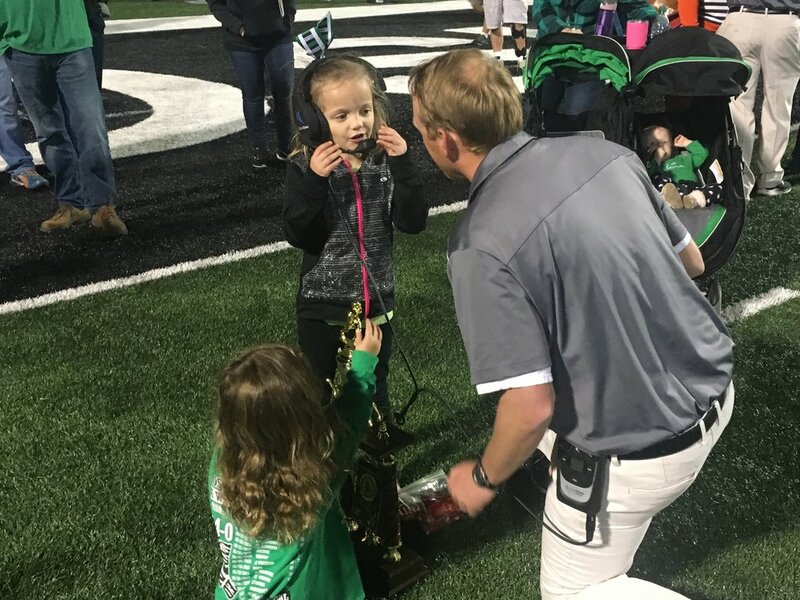 Coach Ford taking time with his daughters after a Roswell win. They would be loved and taught how to love one another. I witnessed this from afar this season as the football team modeled leadership and unity for their community following the tirades of a racist administrator. In a situation that could have easily and justifiably torn a team and a community apart, the Buford Wolves modeled community and love for all the world to see. * If you need more evidence, Twitter is full of Buford’s recent athletes expressing gratitude for the investment Coach Ford has made in their lives. *Ironically, Buford City Schools Superintendent Geye Hamby’s racist comments sparked an initial reaction of administrative leave with pay. Lose a playoff game… immediate termination. 2. Buford athletes would get help in their recruiting journeys. A quick glimpse of twitter shows the effort that Coach Ford always makes to help his athletes find opportunities at the next level. It’s an important part of coaching at the highest levels of our state. 3. Buford would continue to be a really good team. Guess what, that happened as well. Although it seemingly fell short of their community’s expectations. Buford has been a really good team. The Wolves went 21-5 in Coach Ford’s two years at the school. He guided the Wolves to a pair of Region 8-5A titles and one state semifinal appearance in 2017. Some of those few losses also came from stepping into the lion’s den again higher classified teams. In fact, this last season, Buford outscored its five region opponents 253-9. Now, the Buford chapter of Coach Ford’s life is seemingly complete. On every metric that should matter for a coach, John Ford has done an incredible job. Some coaches only talk about character in their season-ending banquets. Coach Ford models it and teaches it every single day. Some coaches are more concerned with their own careers than their athletes’. Coach Ford puts in the time and effort to create opportunities for his players, some of whom will soon be playing in the NFL. (If you don’t believe me, watch Xavier McKinney play for Alabama against Georgia this weekend. #WellMade) Finally, some coaches are simply reflections of the talent they might happen to have any given year. Coach Ford builds a program that starts at 7 years old and builds athletes that become champions, on the field, but also in life. Maybe there is someone out there who can help Buford win another championship. However, finding someone with the same character as Coach Ford is a tall order. Some team out there is going to secure one heck of a coach in John Ford. Maybe he’ll coach on the next level for a college team. Maybe he’ll take an opportunity in a different state. I have no idea, but I know he is bound for even more greatness. I imagine administrators and boosters are getting together right now to form their own sets of criteria for what their schools and programs need. If you want to win a state championship, John Ford just might be your guy. He can get you there. However, if you just want to win a state championship, you’re getting more than you need with John Ford. You’re getting a shaper of men who could be your communities very own Eric Taylor (Who doesn’t love Friday NIght Lights?) Ford is the kind of leader that could help your community move past long-held divisions. If you’re looking for more than just someone to make your team better, but also someone to make your community better, you couldn’t find a better man than Coach Ford.